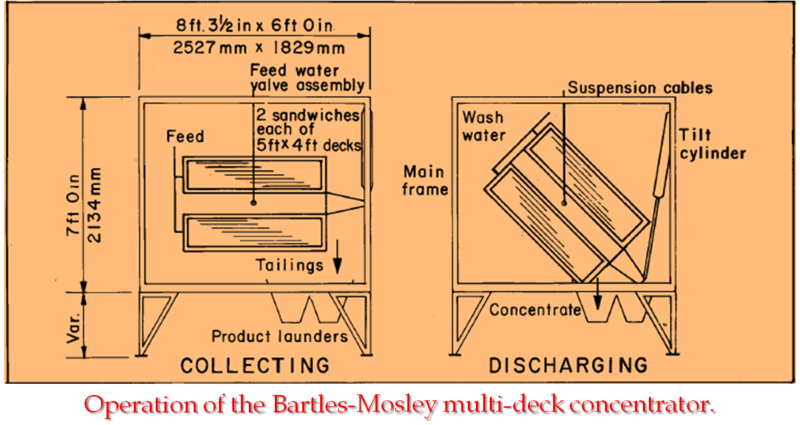 The Bartles crossbelt separator is designed to upgrade concentrates from the Bartles-Mozley table, in the size range of minus 100 (roughly 160 mesh) to 5 microns. This cleaner consists of an 8 foot wide endless PCV belt with a central longitudinal ridge. The belt slopes slightly from the ridge out to the sides. As the belt moves, a rotating weight imparts an orbital motion. The belt assembly is freely suspended by four wires. 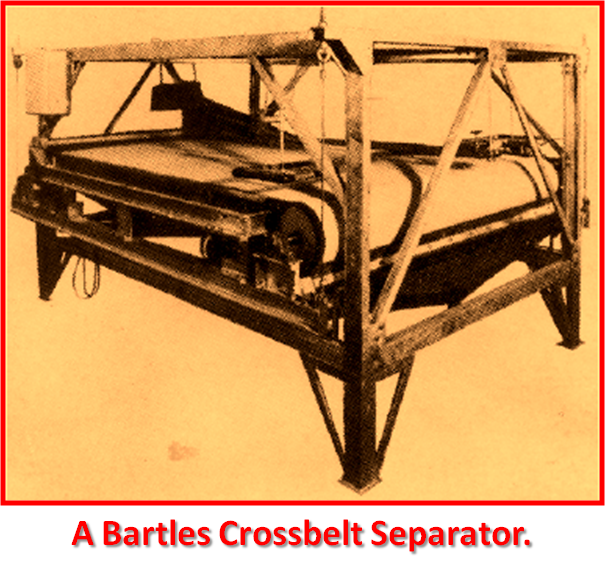 A Bartles crossbelt separator. Feed in slurry is introduced along half of the length of the central ridge. Heavy mineral particles are deposited on the belt while light material, held in suspension by the orbital shear, flows down the belt off the sides. 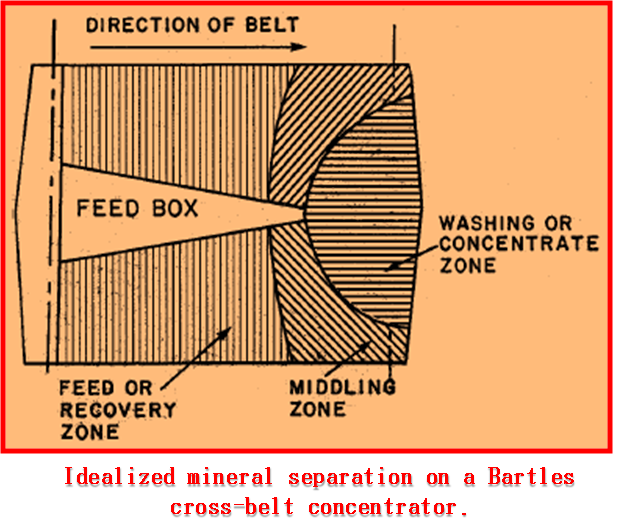 The concentrate travels along with the belt through a cleaning zone where middlings are washed off the belt. Finally, the clean concentrates are discharged over the head pulley. In operation, the Bartles crossbelt separator consistently outperforms conventional fine sand and slimes tables. It has proven particularly effective in recovering material from 150 to 20 microns (minus 100 mesh) with a capacity of 1/2 ton per hour. The width of the concentrate band on the unit is roughly two-thirds the width of the belt, or over 5 feet. The concentrate band on slimes tables does not generally exceed seven-tenths of a foot. This wider band allows a distinct cut to be made between concentrates and middlings on the Bartles machine. In addition, recovery can be finely controlled through adjustment of the orbital shear. This parameter has the greatest effect on recovery. The separator also uses less wash water than conventional equipment. The Bartles crossbelt separator is an attractive alternative to conventional shaking tables. Centrifugal concentrators have been in use since the early days of mineral processing. Although centrifugal devices were never extensively used, recent innovations may make their use more widespread. In this section, which is by no means comprehensive, the bowl concentrator and the new Knelson concentrator are described. Bowl concentrators have been used only to a limited extent in small placer operations. The two most popular designs were the Ainlay and Knudsen bowls. There is little difference in design and operation between the two, except for riffle design and minor variations in bowl size and shape. They were used primarily as cleaners, but have fallen into disuse due to the availability of more efficient equipment. Generally, the typical bowl concentrator is a basin 12 to 36 inches in diameter at the rim, lined with rubber riffles along the inner surface. The bowl is mounted on a vertical shaft, which spins at over 100 rpm. Material smaller than 3/8 inch down to 1/8 inch is fed with wash water into the bottom of the bowl. The centrifugal force of the spinning bowl causes a film of material to travel upward along the inside of the bowl. The heavy material catches underneath the riffles and lighter particles are washed out over the rim. When the riffles are full, feed is shut off and the concentrate is washed out. Capacities range from 1/2 to 5 cubic yards per hour (roughly equal to 1 to 8 tons per hour), depending on the size of the bowl. The larger bowls require up to 30 gallons of water per minute for processing. The main advantages of bowls are reduced power consumption and less water use than comparable equipment. On the negative side, however, recovery of gold can decrease as a result of the compaction of concentrates in the riffles. In addition, frequent cleanups, which require halts in operation, are required. The availability of more efficient equipment limits the widespread use of bowl concentrators. One newly designed concentrator seems to eliminate these negative factors. the cone until cleanup, while tailings are continually washed out over the top. There are currently five models available, ranging in size, as measured at the diameter of the cone, from 7.5 inches to 30 inches. These units have capacities from 1 to 25 cubic yards per hour. All models require less water than a conventional sluice and take up very little space. particles are forced out against the walls and are trapped between the ribs. Lighter particles are carried by the water flow out the top. The cone is surrounded by a pressurized water jacket that forces water through holes in the cone to keep the bed of heavy particles fluidized. The force of the water acts against the centrifugal force of the rotating cone. This counterforce is strong enough to inhibit severe compaction of the collected concentrate. As a result, the mineral grains remain mobile, allowing more heavy particles to penetrate. As processing continues, lighter particles in the mobile bed are replaced by incoming heavier ones, until only the heaviest particles in the feed are retained. Clean-up is accomplished by stopping the cone, opening a drain at the bottom, and flushing out the concentrate. This is usually done at the end of a shift. Apparently, this process is very efficient. Tests conducted by CSMRI and others have produced consistent gold recoveries above 95%. In Alaska, ore samples from mining properties were processed using Knelson concentrators. In one case, material originally evaluated at $5.00 a cubic yard yielded over $12 a yard in recoverable gold when tested with a Knelson concentrator. In a second case, the recoverable gold value increased from $3 to $30. 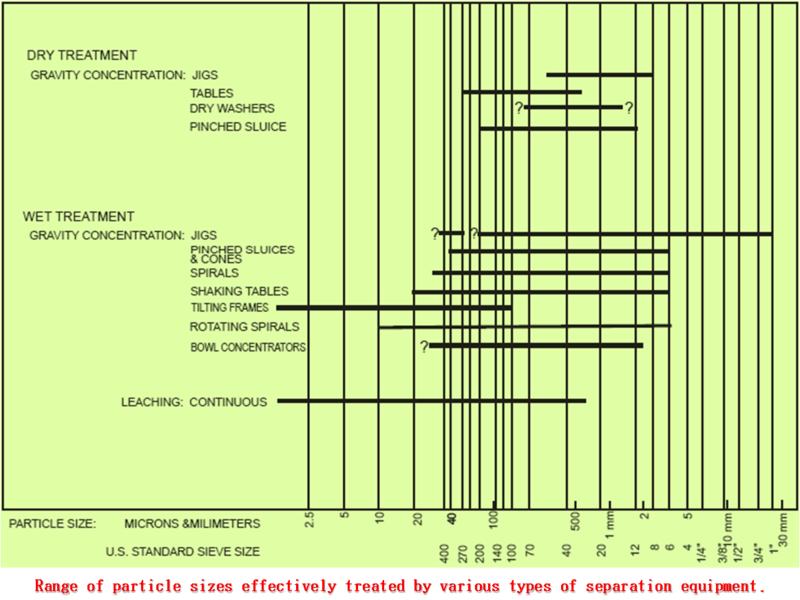 According to CSMRI tests, the machine has recovered gold as fine as 38 microns (400 mesh) (Spiller, 1983; McLure, 1982). 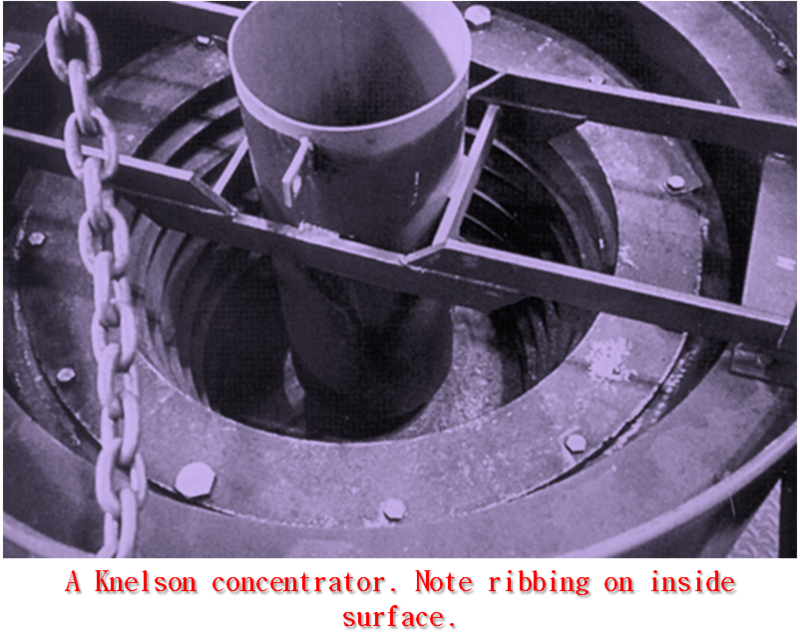 The Knelson concentrator is an efficient, portable machine with a number of advantages. The unit uses less water than conventional sluices. The amount of concentrates saved is small (around 5% or less of the initial feed weight), so final cleanup is easier. The concentrator is portable and easy to use, and it efficiently recovers fine gold. It is relatively inexpensive and requires little maintenance. The smaller machines are suitable for exploration or mineral concentration for small placer deposits. Depending on size, these devices are suitable for use as roughers, cleaners and scavengers. The Knelson concentrator should be seriously considered when purchasing recovery equipment. 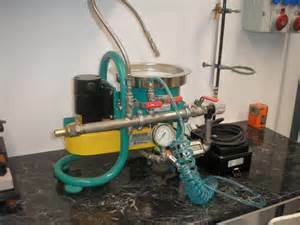 Many types of efficient placer gold recovery equipment are available today. The choices facing those designing a recovery system for a particular site are not easily made. A major consideration, of course, is cost versus recovery, but other factors must also be considered when designing an effective system. The size distribution of the gold is important because it will narrow your selection of equipment that can be used for recovery. The size distribution of the raw material will also determine if classification of the ore is necessary for better recovery. The processing capacity of the equipment must conform to the mining plan. Cleaners usually have relatively low capacities and may limit the total amount of ore that can be processed. Finally, as important as the recovery efficiency of the equipment is, in some cases, most notably with highvolume operations, optimum recovery is some- times sacrificed for increased capacity. Also, efficiency can be affected by factors not controlled by the device, such as feed-flow rates. recovery and have the knowledge and resources to work through whatever problems that may develop. Some equipment companies will process a sample of the ore through their test plants or devices to test the effectiveness of their equipment. If financial limitations preclude the hiring of a consultant, other avenues exist for information. It may be helpful to converse with the operators of successful mines or mills, although they can be less than totally objective. The advice of respected experts can aid in solving problems and making good decisions. Retired miners, libraries, and equipment manufacturers are all good sources of information. Ideally, most of the research and problem solving should be completed before the equipment is obtained. A systematic approach to gold recovery will reduce the difficulties involved in designing an efficient recovery system.